Flywheel All10" 11 1/2" 14" 6 1/2" 7 1/2" 8"
Below are the dimensions for Diesel Engine flywheel housings designed and manufactured to SAE J617C. Please select your engine housing based on the information below. Should your engine dimensions be different to those below, please contact us as we also have non SAE standard options available. 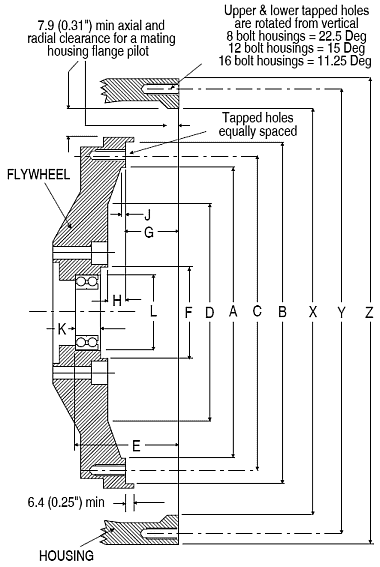 Below are the dimensions for Diesel Engine flywheels designed and manufactured to SAE J617C. Please select your flywheel housing based on the information below. Should your flywheel dimensions be different to those below, please contact us as we also have non SAE standard options available. 10" 11 1/2" 14" 6 1/2" 7 1/2" 8"
Below are the dimensions for common hydraulic pump flanges. Should your pump have a different flange than below, please contact us as we can supply custom pump flange interfaces if required. SAE-A 2 Bolt 3.25" 4.187"
SAE-B2/4 Bolt 4.00" 5.750" 5.000"
SAE-C2/4 Bolt 5.00" 7.125" 6.375"
SAE-D 4 Bolt 6.00" 9.000"
SAE-E 4 Bolt 6.50" 12.500"
SAE-F 4 Bolt 7.00" 13.781"